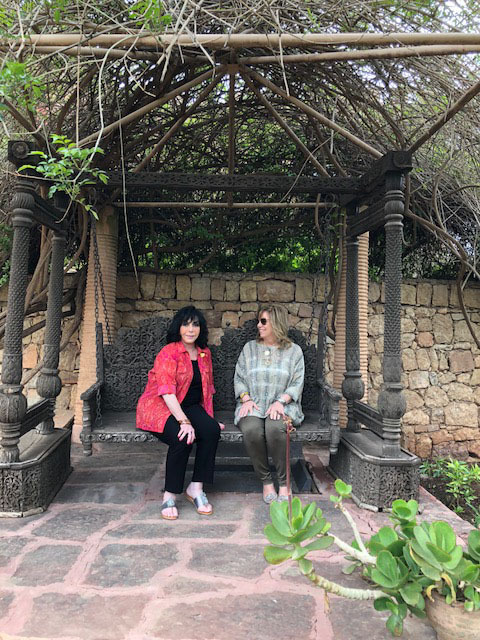 Interior designer and world traveler Marilyn Rose delighted in her late spring trip to Morocco with “dear” friend Dawn Weill. The North African country bordering the Atlantic Ocean and Mediterranean Sea is home to 34 million people. From panoramic views of snow-covered peaks to the sand dunes of the Sahara, Morocco boasts a rich heritage of Berber, Arabian and European cultural influences. Medieval cities and modern mosques display a diversity that has attracted a sophisticated, international community to its shores. Captivated by its archaeology and colorful history, Marilyn and Dawn embarked on their amazing journey from Casablanca, the country’s largest city, chief port and the commercial hub of western Morocco whose French legacy is evident in the Moorish architecture and European Art Deco. In Casablanca, the two visited the extremely impressive Hassan II Mosque, largest mosque in Morocco and second largest in Africa. And, it is the only mosque in Morocco non-Muslims can visit. Built in five years with workers laboring day and night, it was completed in 1993 with ¾ of the enormous structure positioned on a promontory jutting out over the Atlantic. An imposing minaret, the world’s tallest at 210 meters, is topped by a laser with light directed towards Mecca. Its balcony, where the muezzin calls Muslims to prayer five times each day, climbs 60 stories into the sky. The mosque accommodates 25,000 inside and an additional 80,000 in the courtyard. The city boasts the traditional water sellers in colorful elaborate red costumes with wide-brimmed Berber hats. They ring bells and sport copper or brass cups and goatskins filled with water. Historically, they carried precious water to desert inhabitants. Rabat, Morocco’s capital granted World Heritage Status in 2012, is known for its Islamic and French colonial architecture. It is home to the ancient Kasbah of the Udayas, a Berber era royal fort overlooking the water surrounded by gardens. Marilyn and Dawn stayed in a beautiful boutique hotel and spa called Villa Diyafa, their favorite hotel and restaurant on their tour. In Rabat, they visited the royal palace, Dar al Makhzen, the king’s official residence where he entertains and meets with dignitaries. Situated in nearby Volubilis, a partly excavated Berber and Roman city considered the ancient capital of Mauretania, they toured the Roman ruins dating from 140 A.D. Its early prosperity, principally from olive growing, led to the building of many fine town houses with world famous mosaic floors erected in the 2nd century. Berbers were the first people of North Africa dating back 10,000 years and have occupied the area surrounding the ruins for centuries. The name Berber comes from an ancient Egyptian term meaning outlander. Of the 25 million Berbers in North Africa, the majority are Sunni Muslim. Marilyn said their Berber guide was highly educated with a beautiful vocabulary and outstanding knowledge of the area. He came from a small village and told his travelers that many young Berbers are leaving their villages to become educated at the universities. Berber tour guides enjoy a high status among their people and must pass a rigorous international test to become official guides. 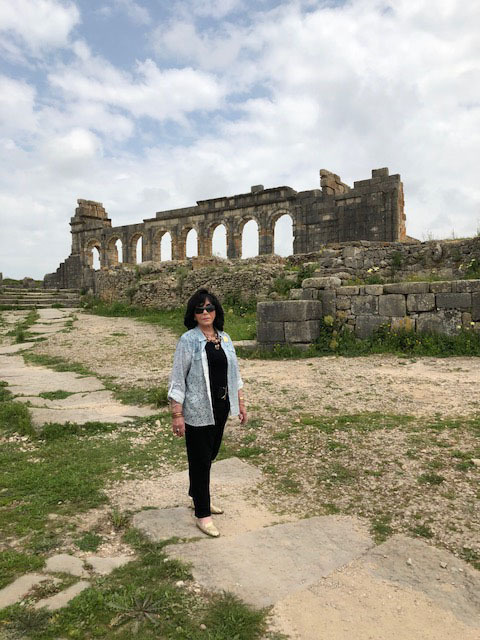 With their experienced driver Amin and Berber guide Moussine leading the way, Marilyn and Dawn took a side trip to Fez, a historic inland city of medieval palaces, mosques and world-renowned tanneries. The medina of Fez, a World Heritage Site, is one of the world’s largest urban pedestrian zones. The city is home to religious schools known as madrasas. In Fez, Marilyn and Dawn visited the famous Golden Doors of Palais Royale, a palace still used by the king of Morocco today. Marilyn tells us the huge golden doors are cleaned with lemon every day. Marilyn said she would pass on that job! Here, the pair toured a souk, an ancient labyrinth market with 9,000 passageways selling art, meat and items of every kind. Prices are not displayed and bargaining is the norm. The experience can be stressful for those unused to purchasing goods by negotiation. Although the souk was interesting, there were areas displaying animal parts Marilyn and Dawn were not used to seeing. There was clothing very nicely displayed in other areas not near the food stalls but seeing all different types of meats and food out in the open was not Marilyn’s idea of Whole Foods Market! After Fez, Marilyn and Dawn were on their way to glamorous Marrakesh, the Red City. The seven and a half hour trip over good roads wound through pastoral scenes with olive and cork trees, cacti, beautiful wild flowers and grazing farm animals. Exotic and mysterious, Marrakesh has attracted a burgeoning international community of the rich and famous. One example of the city’s attraction for the glitterati is the cobalt blue Cubist villa, designed by French architect Paul Sinoir in the 30’s, and named Jardin Majorelle after painter, Jacque Majorelle, the originator of the complex. Majorelle acquired the property in 1922 and, over a 40 year period, created the two and a half acre botanical and landscape garden. Magnificent specimen trees from all over the world were planted. Fashion designer Yves Saint Laurent with his partner Pierre Berge bought the property in 1980 and restored it to its original splendor. Saint Laurent’s ashes are scattered in the garden. Today, the estate houses the Islamic Art Museum of Marrakesh, the Berber Museum displaying pottery, jewelry and religious artifacts some dating back 10,000 years and the Musee Yves Saint Laurent. Ancient jewelry and Berber dress are displayed in the museum. In Berber culture, the dowry is given by the man to the woman as marriage is considered the most important contract. A bride’s jewelry becomes her property that she can sell to support her family if necessary. She may also use it purchase cattle or land. Berber jewelry has a symbolic and mythical meaning besides ornamentation; it represents the relevant status of the wearer. The higher the status, the more jewelry. In fact, they wore so much jewelry Marilyn thought it would be hard for them to walk around the village! Marilyn and Dawn rounded out their Moroccan odyssey with a tour of the high Atlas Mountains surrounded by magnificent views, fresh air and dotted with little Berber villages carved into the hillside. Sir Richard Branson’s award-winning hotel, Kasbah Tamadot, bought by Branson while he was on a ballooning expedition, enjoys a lofty setting in these spectacular mountains. Its 28 rooms and suites are each individually decorated and feature antiques from all over the world. 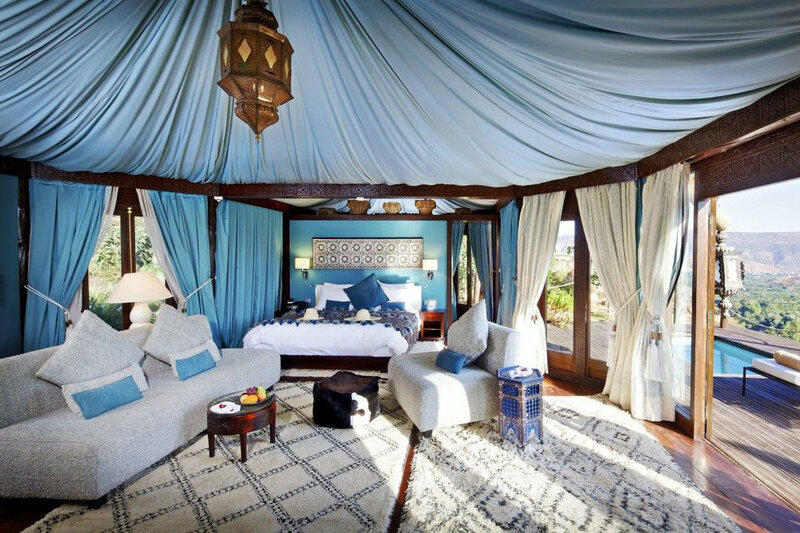 There are also eight luxury tents for the person who really wants to get into the feeling of the high Atlas Mountain. The tents, said Marilyn, would be lovely places for hikers to experience the area. After their enjoyable and exotic journey, Marilyn and Dawn were thrilled with all the natural beauty and amazing architecture they experienced and were now ready to take the incredible sights back home to our wonderful country, America.